Recently Nicholas Levinge from England visited India and joined many a meetings formal and otherwise on philatelic matters. His chosen subject is the King George V Silver Jubilee issues of all countries and he is the founder President of the King George V Silver Jubilee Study Circle. He also undertook research at the National archives of India for about 3 months on the Silver Jubilee issue of India. Alas without much luck. We have been busy during his visit with various exhibitions including Stamps of India National Exhibition where Levinge volunteered and was a great help in mounting and dismounting of the exhibits. We had promised that we will search and collate all the information we have access to on the subject and share it with him. The following is result of our work. George V, became the King of the United Kingdom and the British Dominions, and Emperor of India on May 6, 1910 at the death of his father King Edward VII. His 25 years of Reign was celebrated as Silver Jubilee. On this occasion 59 countries besides India issued commemorative postage stamps. 44 postal administrations issued a common stamp design that was a first for a British colonial issue. 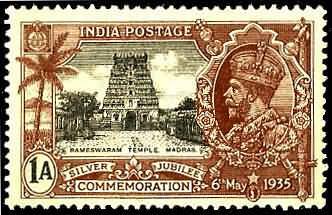 India issued its own unique design in a set of 7 stamps on May 6, 1935. 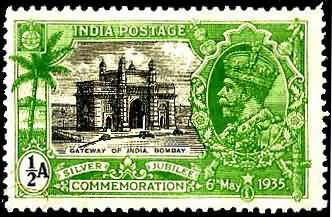 The monuments featured on the stamps were Gateway of India Bombay, Victoria Memorial Calcutta, Rameswaram Temple Madras, Jain temple Calcutta, Taj Mahal Agra, Golden Temple Amritsar, and Pagoda in Mandlay. These stamps were designed by H W Barr, Engraver at the Security Printing India as the India Security Press at Nasik Road was then known. He had joined the Press at its inception on a five year contract and after completion of his second five year contract left India in March 1935 upon his retirement. He was succeeded in office by T I Archer, a name well known to those interested in Indian philately. Mr Barr was responsible for the organisation of the work of the Studio from the inception of the Security Press, and the for the bulk of the original design work. Apart from his work on the designs of Government currency Notes, he redesigned the whole range of higher values of court fee and non-judicial impressed stamps, the series of Government of India cheques, the Inauguration of New Delhi Commemorative series of Postage Stamps and the Silver Jubilee Issue, in addition to many other items including work for Indian Native States. The Director General's Special circular No. 64 of the March 5, 1935 states that these stamps will be printed for the normal consumption of three months only and the sale of corresponding denominations of the ordinary postage stamps now current will remain suspended so long as the Jubilee stamps are on sale in the post offices. These commemorative stamsp will be used for prepayment of postage and airmail fees on all postal articles and for payment of telegraph charges as well. During the currency of Jubileee stamps, ordinary postage stamps now current will also be accepted, if used by the public on postal and airmail articles and telegrams. No service commemortive stamps will be issued. The Annual Report of the Indian Posts and Telegraphs Department for the year 1935-36 states that these pictorial stamps remained on sale up to December 31, 1935 when the unsold stocks were withdrawn and destroyed. 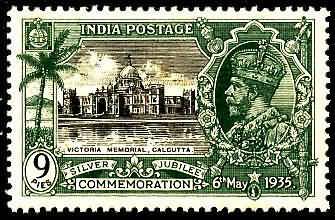 The discovery of the exact quantity printed and sold is the final frontier of India's Silver Jubilee issue. The accompanying Postal Notice to the above Circular states that a set of 7 stamps will be issued on May 6, 1935 and will be available at all post offices in India and Burma. However the denominations listed in the Notice are ½ Anna, ¾ Anna, 1 Anna, 2½ Annas, 3½ Annas, 8 Annas, and 1 Rupee. Another Postal Notice of April 17, 1935 modified the above stating that the stamp in the denomination of 1 Rupee will not be issued and that instead stamps in the denomination of 1¼ Annas will be issued. 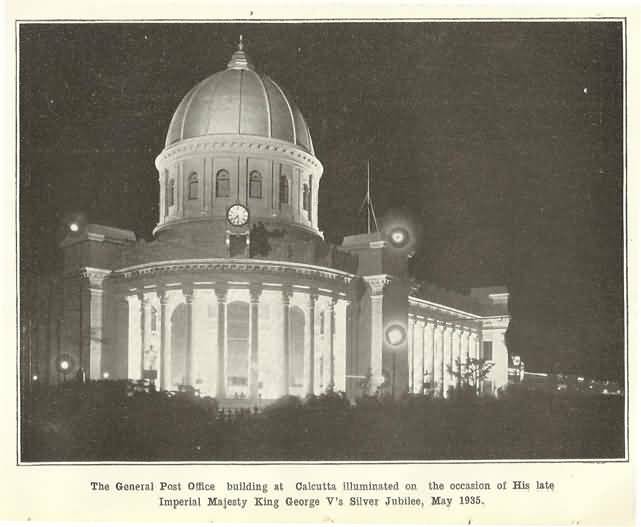 The Post Office Building at Calcutta GPO and several other places were illuminated on this occasion. 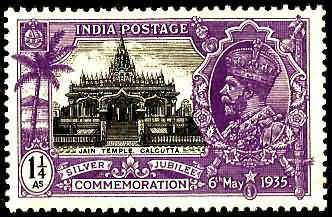 Although Monday, the May 6, 1935 was observed as a Post Office holiday on acccount of the Silver Jubilee of His Majesty the King E'mperpor's accesion to the throne vide Postal Notice of April 18, 1935. 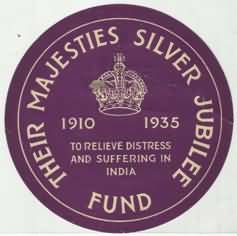 A Postal Notice of February 28, 1935 states that a special stamp called Silver Jubilee Postal Seal has been issued by their Majesties Silver Jubilee Fund India and will be on sale at selected post offices from April 1, 1935 to May 15, 1935. The proceeds of the sale of the Seals will be used for the relief of distress and suffering in India. These Seals will not be recognized in payment of postage or any other postal or telegraph charges. The Postal Notice of May 8, 1935 extended the date of sale of the Seals to May 31, 1935. A poster for the 1 Anna Seal was also put up in the post offices. A severe Earthquake of 7.7 magnitude on Richter scale devastated Quetta on May 31, 1935. A Postal Notice of June 7, 1935 resumed the sale of Silver Jubilee Postal Seals now for the benefit of His Excellency the Viceroy's Quetta Earthquake Relief Fund. This sale was discontinued with effect from January 1, 1936 vide the Postal Notice of December 13, 1935. A slogan postmark 'Support the Jubilee Fund' in about 3 distincts types are known, two types of Duplex and another is boxed type. 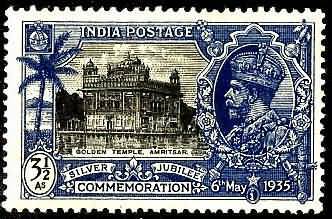 This were used at at selected post offices in India during the year beginning with April 1, 1935. Stephen Smith, distinguished aero-philatelist and pioneering astro-philatelist commemorated the Silver Jubilee by commemorative rocket mail on March 23, 1935 for which special labels were also produced by him. 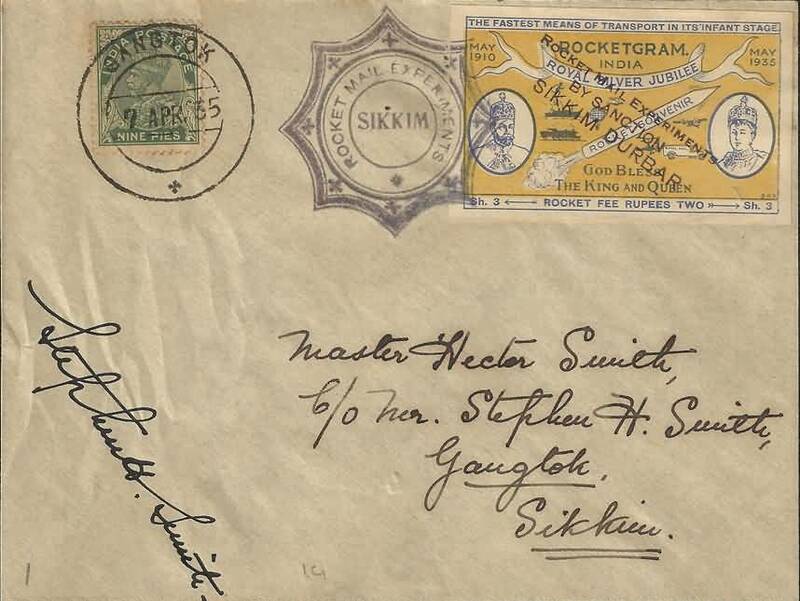 Later in between April 7 and 13, Smith launched 9 more rocket mail flights in Sikkim commemorating Silver Jubilee. 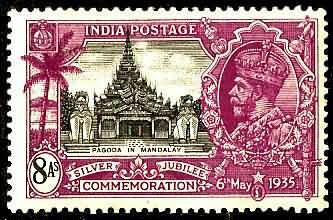 6 denominations, 6d, 1s, 2s 6d, 10s, 15s, and 20s, of the Silver Jubilee issue of British Postal Orders overprinted 'India' were put on sale at post offices in India on May 7, 1935 according to the Postal Notice of May 3, 1935. 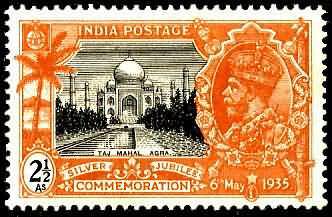 Jack Harwood, an acknowledged experet on postal orders of the world, has this to say on our request for information and imgaes for these: "Unfortunately, I have never seen a Silver Jubilee Postal Order overprinted for India. Ordinary British SJ issues of any but the 6d and 1/- are difficult enough to locate. Actually, I don't believe I've ever seen the SJ Postal Orders overprinted for any colony or territory. There are no such items in my collection. I've viewed most of the major collections of postal orders in the UK, and do not recall ever seeing an overprinted Jubilee issue in any of them. I have checked with several other postal order collectors, and no one seems to have seen any overprinted SJ examples, India or anywhere else. Only 4 million of each denomination were printed, so numbers sent overseas from the UK must have been very small."